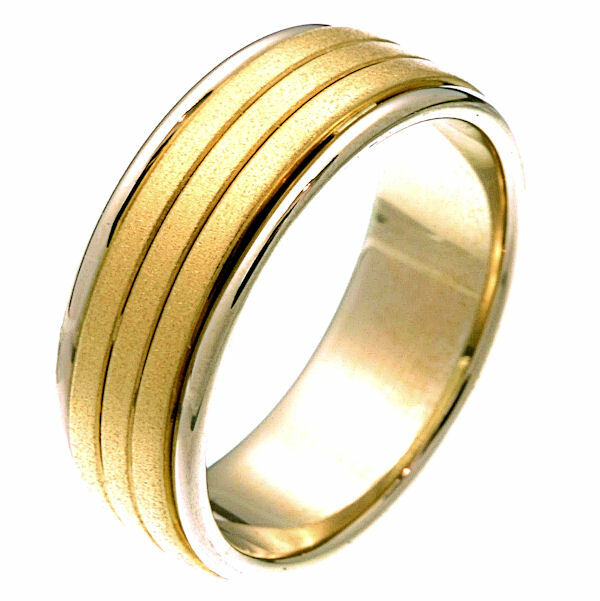 Platinum and 18 kt yellow gold comfort fit 8.0 mm wide wedding band. The center portion has a sandblasted finish and the sides are polished. It is 8.0 mm wide and comfort fit. Different finishes may be selected or specified. Just as I pictured it will be. The engraving was visibly written and the gold was solid with a little weight to it. Thanks weddingbands. GREAT SERVICE!!! Not only did I need my ring in size GIANT 15 but I also had it altered to a thinner height size 1.8mm down to 1.4mm. I did price the ring with 2 local jewelers and both came in at over triple the price. It was ready and shipped within days and when I received it it was just perfect. Edessa gave me the best service I have received in pretty much any internet service business I have ever shopped at. Further the quality and execution of the workmanship keep in mind this was custom was way beyond expectations. AAA Plus. would recommend to anyone. Very please with the quality service and cost provided by WeddingBands. I would highly recommend your Company.